A farmer who was trampled by his herd of cows after they stampeded when a fire engine siren apparently startled them, has died in hospital. Harold Lee, 75, was moving 100 cows from Robin's Farm in Burtle, Somerset, with his son Richard when a fire engine answering a 999 call approached them. Mr Lee suffered chest and head injuries in the incident. He was airlifted to the Royal United Hospital in Bath before being transferred to Frenchay Hospital. Mr Lee was leading the herd along the B-road to the milking parlour on 11 August when the cows stampeded back towards their field. 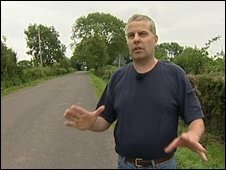 Speaking last Friday his son Andrew told the BBC: "Father got off his quad bike to try to stop the cows, and they literally ran him over and kicked him to the ground. "I think if they (the firefighters) had stopped and took their time for literally four minutes, they would have been on their way and this could all have been prevented." A Devon and Somerset Fire and Rescue spokesman said it was responding to a call to a road accident when it encountered the cattle. He said: "A man was injured by stampeding cattle and firefighters gave first aid at the scene prior to the arrival of the ambulance service. "It is understood that this man has subsequently died and the sympathies of the service are with his family and friends. "As this matter is now under police investigation it would not be appropriate to comment further." Avon and Somerset police said the incident was being investigated and the possibility the cows were frightened by a fire engine was one line of inquiry.